BEIJING: Prime Minister Muhammad Nawaz Sharif on Saturday held separate meetings with Chinese President Xi Jinping and Prime Minister Li Keqiang, assuring both the leaders that Pakistan fully supports China’s giant One Belt, One Road (OBOR) initiative. Chief ministers of Punjab, Khyber Paktunkhwa, Balochistan and Sindh were also present in the meetings. Nawaz Sharif told the Chinese President that presence of all chief minister of Pakistan's federating units in the meetings reflects national harmony that prevails in Pakistan with regard to country's relationship with China. He said China was a Pakistan's strategic partner which has always stood by the country. Sharif said dividends of Chinese investment would soon start reaching the common people of the country. Earlier the prime minister, chief ministers and federal ministers met with Chinese Prime Minister Li Keqiang at Peoples Great Hall of China. The meeting, according to the Associated Press of Pakistan (APP), focused on intra-regional trade and connectivity as a crucial factor for sustainable development of Asia and beyond. The two sides discussed progress on China Pakistan Economic Corridor (CPEC), – an important part of Chinese President Xi Jinping’s One Belt, One Road vision. 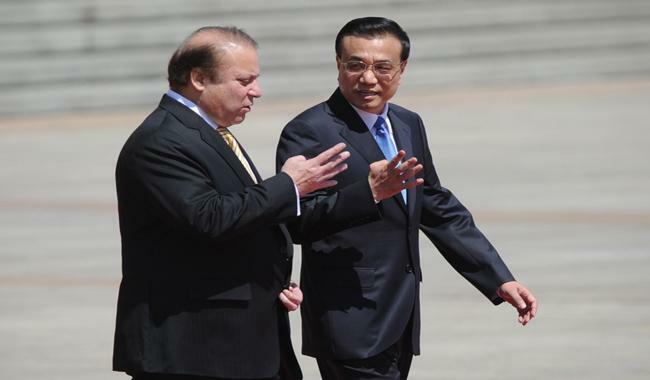 Prime Minister Nawaz Sharif congratulated Premier Li Keqiang on hosting the OBOR forum and said Pakistan fully supports the project. He said composition of his delegation to China particularly the presence of four chief ministers was testimony to the broad-based Pak-China friendship. Pakistan believed that China’s strategic policies in the region were for peace and prosperity, he added. The Prime Minister said Pakistan was grateful to China’s support for the launch of China Pakistan Economic Corridor (CPEC). Late on, Pakistan and China signed various agreements at ceremony which was witnessed Prime Minister Muhammad Nawaz Sharif and his Li Keqiang.